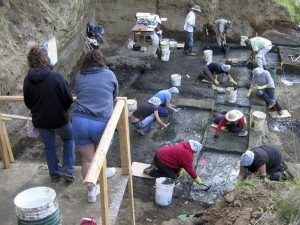 Over the last 20 years, non-credit classes about paleoarchaeology have been offered through Oregon State University, Chemeketa Community College, and Portland Community College. 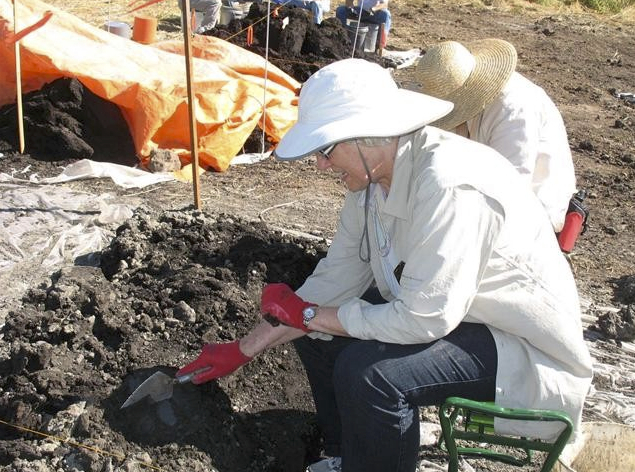 This mini-course continues to provide an opportunity for members of the public, including Seniors, to excavate various pre-Clovis sites in the Willamette Valley. In 2009, students worked with participants from the Yamhill River Pleistocene Project, at McMinnville. 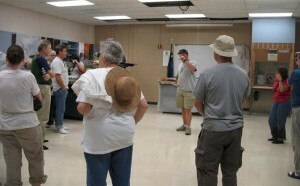 In 2010, students worked at Mammoth Park in Woodburn. Participants learned proper methods while excavating real paleontological sites. Many classes are due to partnerships between the institutions, the public land management agencies, and the Institute for Archaeological Studies. 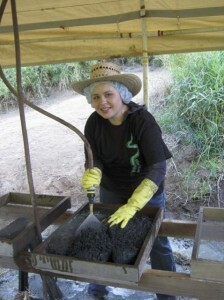 In these situations, members of the Oregon Archaeological Society, with vast site experience, provide friendship and much assistance to students. 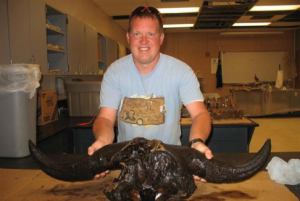 Woodburn High School science teacher, Dave Ellingson, balances a portion of cranium (head) and horn cores from an extinct giant bison. This type of bison could walk up to a standard NBA basketball hoop, raise its head, and scratch its chin. Students from Portland Community College have been involved in this project, which began several years ago with Woodburn High School students. The City of Woodburn provided great support! Further, the host of the McMinnville Mammoth Site, Mike Full, joined this project to add his expertise. Please go to the websites of the Willamette Valley Pleistocene Project and the Yamhill River Pleistocene Project for further information. 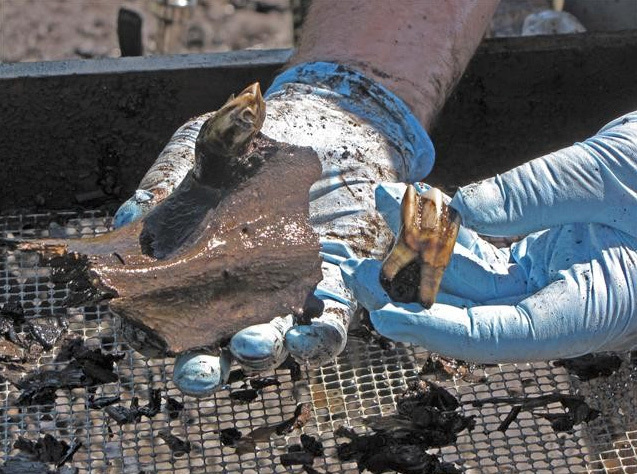 A bison mandible fragment and two teeth are cleaned in the water screening area (below). Photo generously provided by Doug Reynolds. These are the foot and lower legs bones to Bison antiquus, the extinct giant bison. This animal could walk up to a standard NBA basketball hoop, raise its head, and scratch its chin. 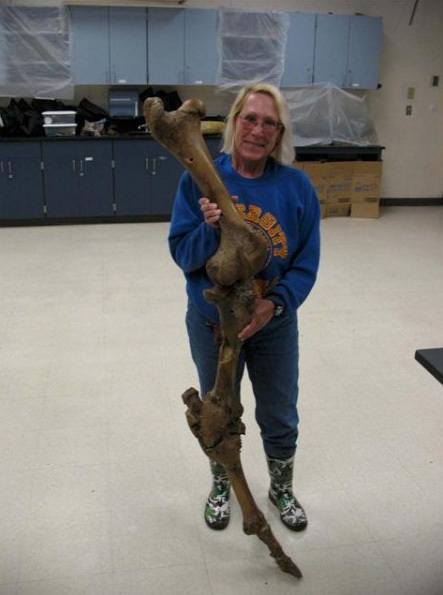 We are testing areas where these remains are from, to find more of this animal, as well as other Ice Age fauna. Field work is a cooperative effort, and is rewarding in many ways, including the building of new friendships. Field labs allow for the immediate assessment of specimen condition, while providing students with an opportunity to learn basic procedures. 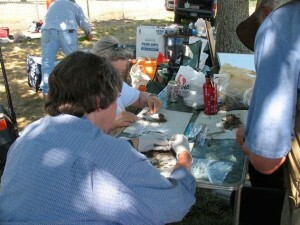 This student experience involves water screening of material that has been excavated. Items recovered from this process will be bagged and labeled, and then transported to the laboratory. Other tasks in which people can participate include excavation, the screening of dry sediments, and documentation. Students had an opportunity in 2013 and 2014 to view the specimens already excavated and stabilized, so they would know more about what the sites had already yielded.